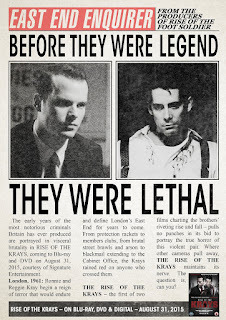 The early years of the most notorious criminals Britain has ever produced are portrayed in visceral brutality in this crime drama, which charts Ronnie and Reggie Kray’s reign of terror, that would endure and come to define London’s East End for years to come. 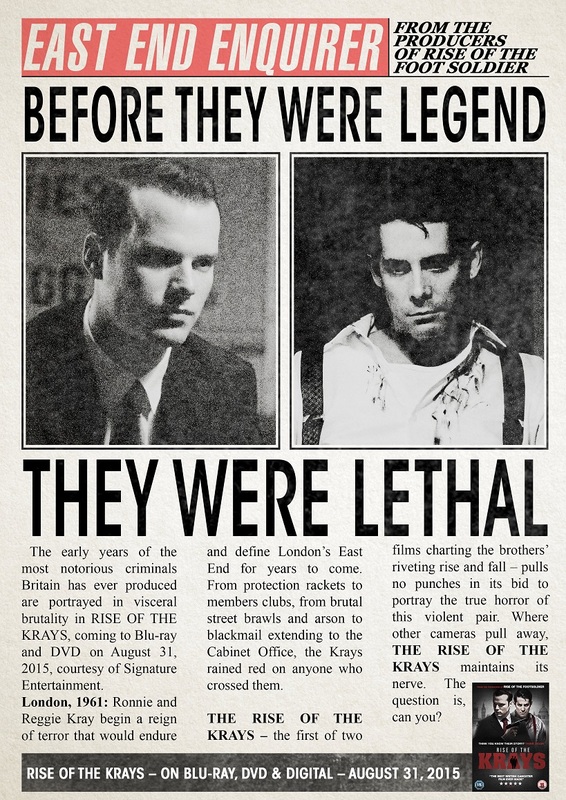 From protection rackets to members clubs, from brutal street brawls and arson to blackmail extending to the Cabinet Office, the Krays rained red on anyone who crossed them. Simon Cotton and Kevin Leslie brilliantly bring the brothers toxic relationship to life, pulling no punches and portraying the complexities of their personalities and motives with aplomb. Scott Cooper’s thriller stars Christian Bale as Russell Baze who must protect his brother Rodney (Casey Affleck) when he becomes embroiled in a murky underworld led by ruthless drug dealer, Harlan DeGroat - played by Woody Harrelson. Set in the borough of North Braddock, Baze works in the local steel mill with the mill’s furnace representing his attempts at living a life on the straight and narrow. However, in seeking justice, Baze is forced to embed himself into DeGroat’s murky underworld in such a way that revenge will hit them the hardest. Nick Cave penned this Depression-era crime drama, which recounts the lives of the three Bondurant brothers- Forrest (Tom Hardy), Jack (Shia LeBeouf) and Howard (Jason Clarke), who are forced to contend with the corrupt District Attorney Mason Wardell (Tim Tolin) and Special Deputy Charles Rakes (Guy Pearce), after refusing to pay the bribes required to maintain their bootlegging and distillery business. Chastain turns in a wonderful supporting performance as Maggie, a dancer from Chicago with a hidden past, who Forrest hires as a waitress for the distillery, and who he eventually falls in love with. After a stint playing John Connor in Terminator Salvation (and the on-set outburst at a crew member which hit the headlines), Bale shed some more pounds yet again to play Dicky Eklund, older brother to boxing champion Micky Ward (Mark Wahlberg), in David O. Russell’s The Fighter. Stealing scenes with aplomb, this was the role in which Bale won an Academy Award for Best Supporting Actor- thanks in no small part to his excellent chemistry with his co-star. This remake of the 1960’s crime caper won over fans and critics alike, due in no small part to the outstanding chemistry between the cast, which included George Clooney, Brad Pitt, Julia Roberts, Bernie Mac and Elliot Gould. Focusing on the exploits of a group of rag tag con-men who plan to rob three Las Vegas casinos simultaneously, this Soderbergh-directed crime comedy pays brilliant homage to old Hollywood, whilst keeping the humour distinctly modern. Providing constant comic relief are Casey Affleck and Scott Caan, who play Virgil and Turk Malloy; the brothers who happen to be brilliant at conning, but utterly hopeless at getting along for more than two minutes. This cult classic stars George Clooney, Quentin Tarantino, Harvey Keitel and Ernest Liu, and follows the exploits of the sadistic Gecko brothers, Seth and Richard (Clooney and Tarantino respectively) and the family they’ve taken hostage (Keitel, Liu and Juliette Lewis). After a string of robberies the siblings head to Mexico and kidnap the Fuller family to cross the border. Arriving at a bar, they quickly realize they’ve inadvertently stumbled into a venue teeming with horrific, blood-sucking vampires. Engaged in a fight for their lives, the Fullers and Geckos are forced to band together to take on the supernatural beings. Francis Ford Coppola’s unrivalled crime drama focuses on the fallout when ageing crime boss patriarch Don Vito Corleone (Marlon Brando) decides to transfer his authority to one of his subordinates. The decision invariably leads to a series of unfortunate events which ultimately begin a war between the major crime families. Al Pacino and James Caan take the roles of Don’s sons, Michael and Sonny, who couldn’t be more different. Cool, reserved and level-headed Michael would rather put plans into motions behind the scenes, whereas Sonny prefers to settle all matters with his fists and street-wise nature. The polar differences between the brothers, and yet their bizarre dependency on each other, is played off brilliantly by Caan and Al Pacino, with fantastic support from a cast that includes Robert Duvall, Diane Keaton and Richard S Castellano.